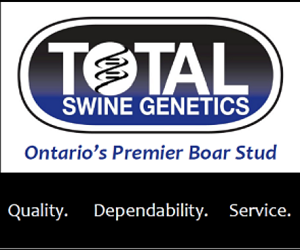 The genetic capability of the modern herd is well beyond the actual level of sow performance. The swine industry has seen a “nutritional gap” developing. Over the past decade, advancements genetics companies have made, have surpassed the pace of the science of animal nutrition. Feed companies have been challenged to keep up with nutrition technologies that push the genetic capabilities of today’s modern swine herd. We decided to get to the bottom of bridging this gap. Two years ago, we started a rigorous sow nutrition project. The goal was to get nutrients working harder for today’s “hyperprolific” sow. We referred to leaders in animal science and swine genetics. We conducted 18 months of research reviews with three animal science focused Universities in Canada and the US, and five industry leading swine genetics companies. We harnessed the power of nutrigenomics research. Research-backed, nutrient-focused sow feeding program. With improved AA specs, updated vitamin and micro/macro mineral levels, the new Masterfeeds Vigor Sow Program is designed for the increased nutrient needs of the modern sow herd. Naturally enhancing sow production through technology. Nutrient technology is the key. We have consistently achieved a reduction in preweaning mortality, an increase in piglets born alive and a reduction in non-productive days. Specialized on-farm consultation ensures efficiency and the best possible return given all variables. The Barn Eye Check Off ensures the details of environmental and management challenges are not overlooked. The Sow Return Calculator uncovers the hidden potential of your herd and ensures return goals are set.